Directions: On this worksheet you will be asked to calculate the normal force depending on a variety of situations. 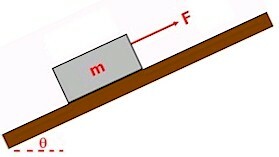 Question 1 What is the normal force acting on a 8-kg mass that is at rest on a horizontal surface? Question 2 What is the normal force acting on a 8-kg mass that is sitting on the floor of an elevator which is accelerating upwards at a rate of 8 m/sec2? Question 3 What is the normal force acting on a 8-kg mass that is sitting on the floor of an elevator which is accelerating downwards at a rate of 4 m/sec2? Question 4 What is the normal force acting on a 8-kg mass that is being pulled up a 38º frictionless inclined plane at a constant velocity of 8 m/sec? Question 5 What is the normal force acting on a 8-kg mass which is being pulled at a constant velocity of 8 m/sec by a rope having a tension of 44 newtons at an angle of 38º to the horizontal? Question 6 What is the normal force acting on a 8-kg mass which is being pushed at a constant velocity of 8 m/sec by a force of 44 newtons along a rigid handle that makes an angle of 38º to the horizontal?